JERUSALEM ― Israeli police on Tuesday prevented Palestinian children taking part in a summer camp as well as a number of Palestinian women from entering the Al-Aqsa Mosque compound, witnesses said. 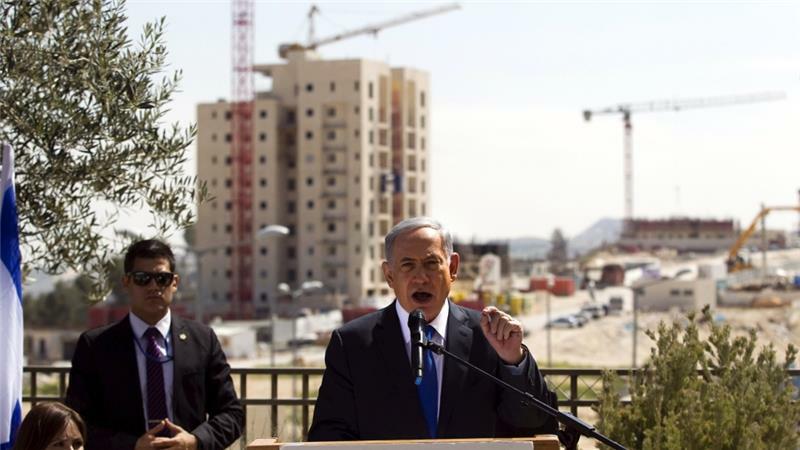 ____Witnesses said that Israeli police “suddenly” deployed at the compound gates and set up iron barriers. ____Israeli police reportedly distributed a list of women’s names at all gates and prevented a number of women, as well as children taking part in a summer camp, from entering the holy site. ____Witnesses added that police deployed at the Lion’s Gate chased children from the area, causing them to panic. NABLUS ―Israeli settlers hurled Molotov cocktails at a public park in the northern West Bank village of Qaryut overnight Monday in a failed attempt to set fire to the park. ____Palestinian security sources told Ma’an that a number of settlers arrived in three vehicles at 2 a.m. and hurled several Molotov cocktails at the park before fleeing the scene. ____The sources said local youths tried to chase the attackers but they sped away. No injuries were reported. ____Residents of the nearby village of Beita said that settlers tried to carry out a separate attack there, but locals noticed them and managed to prevent the attack. HEBRON – Israeli ‘Defense’ Minister Moshe Ya’alon Tuesday morning broke into the Ibrahimi Mosque in the Old City of Hebron. . . . Ya’alon broke into the Ibrahimi Mosque under tightened security protection. ____. . . in anticipation of Ya’alon’s provocative visit, Israeli forces closed down all of the old market gates leading to the Mosque, effectively denying Palestinian Shari‘a Court employees as well as Muslim worshippers access into the Mosque. ____The Mosque caretaker Munther Abu al-Feilat denounced Ya’alon’s act describing it as an attempt to obliterate the Palestinian and Islamic nature of the Mosque and the Old City of Hebron. 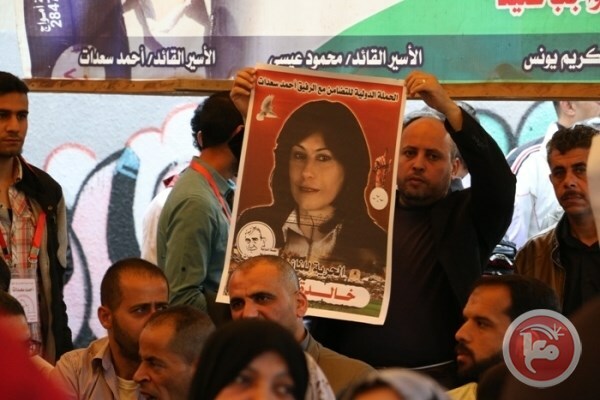 RAMALLAH (Ma’an) — An Israeli military court on Monday postponed a court hearing for Palestinian lawmaker Khalida Jarrar for the third time in a row after witnesses failed to show up, her lawyer said. ____Mahmoud Hassan, director of the legal unit for prisoners’ rights group Addameer, said that the military prosecution had again failed to take the necessary steps to have the witnesses brought to the court. ____”Failure to bring the witnesses prolongs Jarrar’s detention, exhausts her and her family, and undermines her right to have a just trial,” Hassan told the court. ____The court judge on Monday rejected a second request to release Jarrar on bail that was submitted by Addameer last week. . . . In Mel Brooks’ comedy Blazing Saddles, the newly appointed black sheriff of a Wild West township realizes that his welcome ceremony is about to turn into a lynch by the town’s all-white denizens. The black cowboy improvises an ingenious escape plan: he points his gun at his own head and pretends to be taken hostage. ____Fans of Mel Brooks may appreciate the Israeli spectacle, cast in the same mold, which could be referred to as “blame the hand”. . . .
____It has been the mainstay of the Zionist left and the so-called peace camp to blame Israel’s post-1967 territorial entanglement on settlers. According to this view, the settlers have violated the 1967 borders, the settlers . . . the settlers . . . . . . the settlers . . . While these accusations certainly have merit, it is worth remembering that the hand does not operate by itself. It is the head that moves it. And the head is the Israeli government, representing Israel’s Jewish population. From: ENEMY OF THE SUN: POETRY OF PALESTINIAN RESISTANCE. Edited by Naseer Aruri and Edmund Ghareeb. Washington, D.C.: Drum and Spear Press, 1970. ―Available from Amazon. Tawfiq Zayyad was a Palestinian poet, writer, scholar and politician. He was born in Nazareth in 1929 and died on July 5, 1994 in a dreadful car crash while on his way to meet Yasser Arafat in Jericho after the Oslo agreements. He participated in Palestinian political life in occupied Palestine, was elected mayor of Nazareth, and served as a member of the Israeli Knesset. 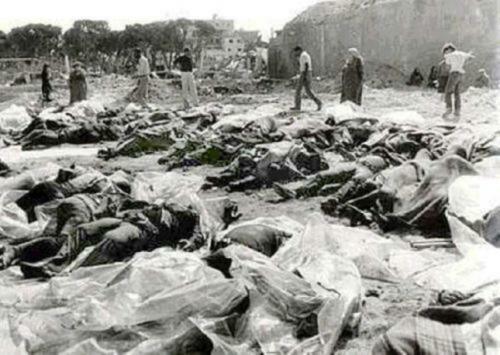 The Kafr Qasim massacre took place in the Israeli Arab village of Kafr Qasim situated on the Green Line, at that time, the de facto border between Israel and the Jordanian West Bank on October 29, 1956. It was carried out by the Israel Border Police (Magav), who murdered Arab civilians returning from work during a curfew, imposed earlier in the day, on the eve of the Sinai war, of which they were unaware. In total 48 people died, including 6 women and 23 children aged 8–17. Arab sources usually give the death toll as 49, as they include the unborn child of one of the women. The border policemen who were involved in the shooting were brought to trial and found guilty and sentenced to prison terms, but all received pardons and were released in a year. . .
Kafr Qasim. October 29, 1956.